Motorcycle transport trip 276 going to Durban and JHB from Cape Town. Loaded up in Cape Town ready to leave for Hermanus. Have you bought or are you in the process of buying/selling a bike. Need to have it transported cross country? This is what we do. Motorcycle transport, door to door, all over SA and Namibia. Multiple trips every week from our depot in Cape Town. 24Hr Sat tracking on all of our vehicles. The most experienced drivers in the industry, having over 7 years experience in transporting bikes. All motorcycles, scooters, trikes, tuc tucs, quads and golf carts. Harley Davidson, Honda, Kawasaki, Yamaha, Ducati. We transport all makes and types of motorcycles all over SA and Namibia door to door. Our trucks leave Cape Town around mid week depending on the load and the route. Travelling up the Garden Route to East London with stops on the way in all the major centres. Then either up to Bloemfontein or Durban then onto Johannesburg. We normally spend two days in JHB delivering and collecting stock then head back to Durban and the Garden Route back to Cape Town. This is a door to door service. We are now transporting bikes to Botswana and Zambia as well as our established trips to Namibia. Some of the bikes we regularly transport. Bike Transport, BMW F800 transport, BMW GS transport. Dirt bike transport and Ducati transport, golf cart transport, GSXR transport. Harley Davidson, Harley transport, Honda, Honda CBR transport, Honda cbr transport. Kawasaki transport, Lucifer’s hammer, Motor bike transport, motor bikes and motor bike transport. 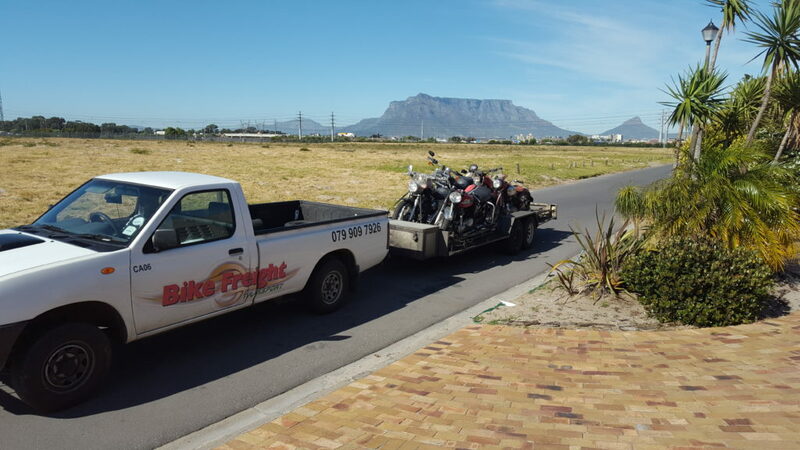 Motorbike transport, Motorbike transport Cape town, Motorbike transport Durban. Motorbike transporter and Motorbike transport Johannesburg, Motorcycle and Motor Bike Transport. Winter Specials motorcycles. 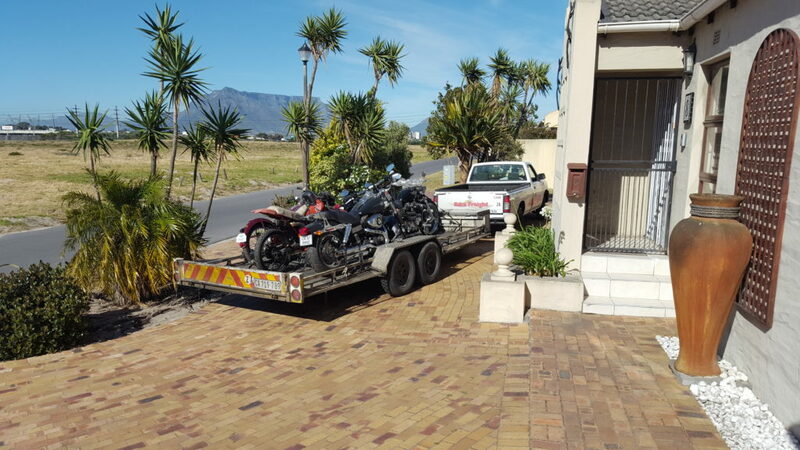 Motorcycle shipping, Motorcycle Transport, Motorcycle transport Cape Town, motorcycle transporter, Motorcycle transport in South Africa, Quad bike transport and Regional Superbikes, scooter transport, Super bike transport and Suzuki transport, Transport bike, Transport Bikes. Transporting motorbikes, transporting motorcycles and transport motorbike, transport motorbikes, transport motorcycle, Transport motorcycles, Yamaha R1 transport.